'Cadillac Frank,' 'Ice Pick Willie,' And The Nicknames Of American Mobsters Over the years, mobsters have drawn attention for their bizarre and at times, silly, nicknames. 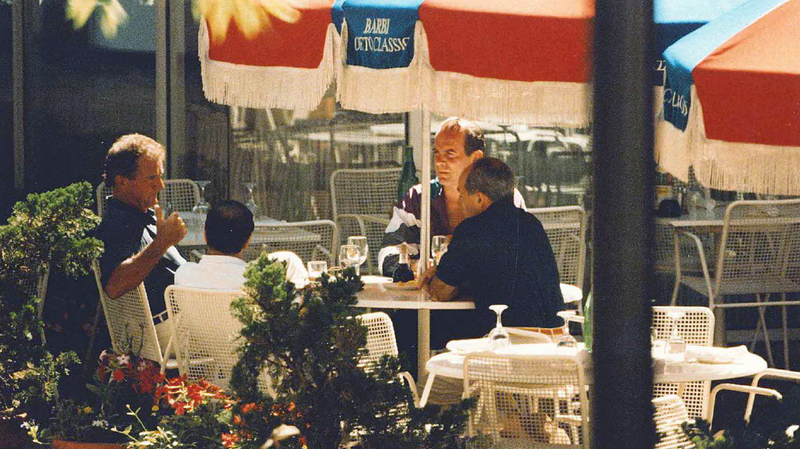 In this 1993 FBI surveillance photo, Francis "Cadillac Frank" Salemme (left), Stephen "The Rifleman" Flemmi (second from left) and Frank Salemme Jr. (third from left) are seated at The Charles Hotel in Cambridge, Mass. Francis "Cadillac Frank" Salemme was found guilty Friday of killing a South Boston nightclub owner 25 years ago. The conviction marks the end of the half-century war on organized crime that was started by Attorney General Robert Kennedy. The former New England mafia boss had long been suspected of the murder, but was not charged until the nightclub owner's remains were dug up in Providence, R.I., in 2016. "Cadillac Frank" is just one of the famously nicknamed mobsters of the 20th century. Mobsters acquire nicknames from many different places: reporters, cops, friends, etc. Some enjoy the nicknames, and others, like Cadillac Frank, are not such big fans. Salemme got his nickname "Cadillac Frank" from working at an auto body shop in Boston, where he specialized in fixing up Cadillacs. But former WBUR crime reporter David Boeri cites another explanation for Salemme's nickname in a 2016 interview with WPRI-TV. According to Boeri, Salemme had a friend at a Cadillac dealership who would key and scrape every 30th or 40th new car coming off the truck. Salemme would buff out the damage and resell the car for a lower price. Boeri said Salemme did not like Cadillacs and drove BMWs, one of which he was driving when he survived an assassination attempt in 1989. 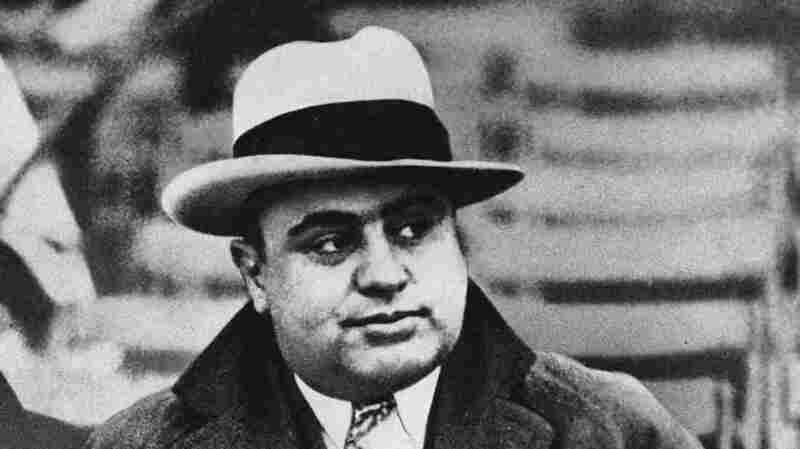 Capone, one of the most notorious gangsters in the United States, was the co-founder and boss of the Chicago Outfit. His nickname stems from an incident that happened while he was working the door at a Brooklyn night club. Capone inadvertently insulted a woman and was then slashed in the face by her brother Frank Gallucio. Capone hated the nickname and when photographed would hide the scarred side of his face, saying the scars were war wounds. He died of cardiac arrest in 1947. 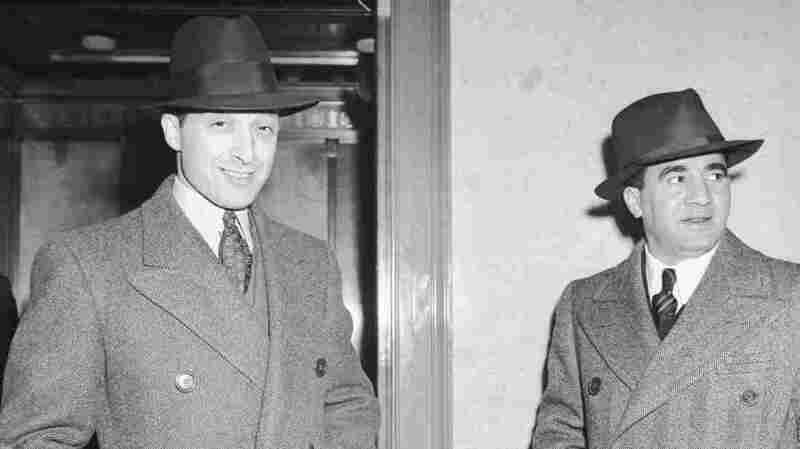 Albert Tannenbaum (left) and Abe "Kid Twist" Reles arrive to testify before the Bronx Grand Jury about the "mistake murder" of Irving Penn, a music publisher that was mistaken for a union man and was killed by mobster associates of Tannenbaum and Reles. Tannenbaum was a hitman for Murder, Inc., the enforcement arm of the Italian-American Mafia, Jewish mob, and other organized crime groups around New York. After World War I, Tannenbaum began working at a resort in upstate New York that was owned by his father and frequented by Manhattan's Jewish mobsters. His nickname, "Tick-Tock" was given to him by Jacob Shapiro because of his ceaseless clock-like nervous banter. Shapiro controlled industrial labor racketeering for 20 years in New York and established Murder, Inc. which Tannenbaum would later join. Tannenbaum died in 1976. Alderman was a mob enforcer in Minneapolis, Minn., during the mid-20th century. He garnered the nickname "Ice Pick Willie" by murdering people using an ice pick to stab them through the ear drum, puncturing the brain, and leaving no sign of foul play during autopsies. Alderman claimed to have committed 11 ice pick murders at the speakeasy he owned in Minneapolis. The victims would slump over the bar, appearing to be drunk, and he would would drag the bodies out with no questions asked. Alderman later became a Las Vegas casino investor and manager, and he eventually went to prison for tax evasion. 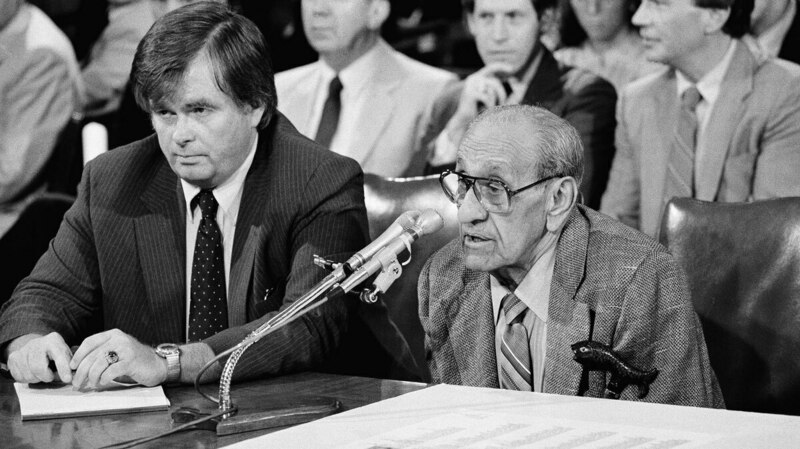 Anthony "Big Tuna" Accardo (right), with his lawyer Carl Walsh, testifies before the Senate Governmental Affairs Permanent Subcommittee on Investigations on Capitol Hill on June 21, 1984. Accardo was boss of the Chicago Outfit and is credited with greatly increasing the power and wealth of the group during his eight decade involvement. During Prohibition, he received his first nickname "Joe Batters." Accardo used a baseball bat to murder three mobsters who betrayed the Outfit. Al Capone allegedly said, "Boy, this kid's a real Joe Batters." The second nickname "Big Tuna" was instituted by Chicago newspapers when Accardo was famously photographed with a giant tuna he caught during a fishing expedition. Of Accardo's death in 1992, Robert R. Fuesel, executive director of the Chicago Crime Commission, remarked that the Capone era had finally come to an end. Angelini was a member of the Chicago Outfit and operated a highly successful sports betting empire. He later became the Outfit's enforcer in Las Vegas, tasked with protecting the organization's illegal casino profits. Angelini's nickname comes from his gambling skills and his work in the betting world. He was known for being well-spoken with a pleasant smile. In 1989, Angelini was sentenced to 37 months in prison on gambling charges from an ongoing operation. He died in 2000. 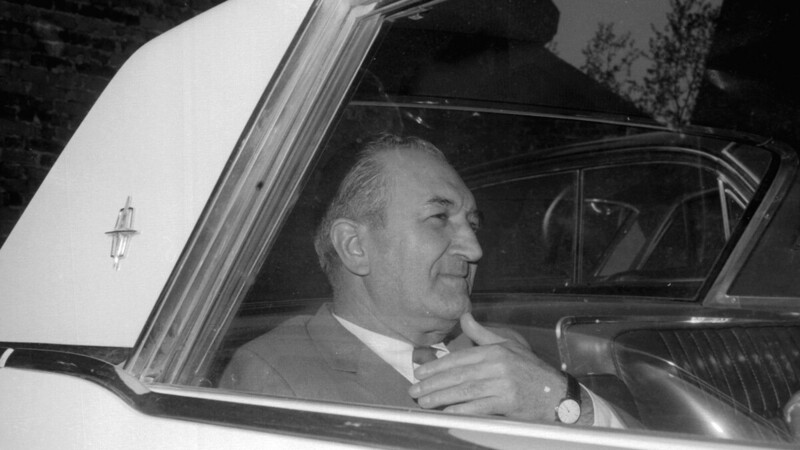 Joseph (Joe Bananas) Bonanno leaving U.S. Federal Court. Bonanno was a Sicilian-born American who became the boss of the Bonanno crime family. He was nicknamed "Joe Bananas" by the newspapers, a reference to both his name and their perception of his mental state. As a result, the entire Bonanno family was sometimes referred to as "the Bananas family" and the fight between the Five Families in New York City from 1964-1968 was titled the "Banana War." Bonanno hated the nickname and much preferred "Don Peppino," drawn from his original Italian name. He died in 2002 of heart failure. Ambrosino was a member of the Persico faction who got his nickname while a cop was chasing him through Brooklyn, according to 2007 estimony by mob informant Larry Matza. The cop was running after Ambrosino for using a fake credit card. With the cop right behind him, Abrosino ran into the local mob hangout, the Wimpy Boys Social Club. This and other occasions led to Ambrosino's reputation as not so bright. Ambrosino later violated Mafia protocol when he instructed his wife to gather up all their guns and put them on the neighbor's porch, fearing the cops were going to search his home. This resulted in a plot to murder his mother. 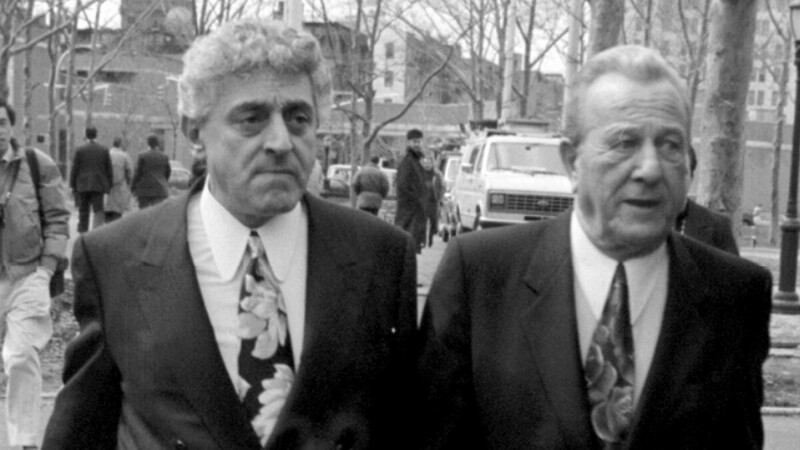 Alleged mob figures Jack D'Amico (left) and Joe DeCicco outside Brooklyn Federal Court, where John Gotti was on trial. D'Amico was a street boss for the Gambino family before becoming acting boss of the family when John Gotti and his son Junior Gotti were investigated by the federal government. According to a mob informant, D'Amico received his nickname because he had rhinoplasty to change what the informant said was a big, distorted nose. D'Amico was not fond of the nickname. He was released from prison in 2012, after serving time for several offenses. Louis "Louie HaHa" Attanasio Jr.
Attanasio was a reputed captain in the Bonnano family who took part in the murder of Bonnano soldier Cesare Bonventre. Bonventre's body was hacked to pieces and placed in three 55-gallon drums in a New Jersey warehouse. Upon the body's recovery, it took forensics technicians three months to identify it. Attanasio earned his nickname "Louie Haha," because he was known to laugh every time he heard of a murder. Attanasio was sentenced to 15 years in prison as part of a plea agreement for the 1984 Bonventre murder. He was released in 2017. In this April 12, 1999 file photo, Luigi Manocchio listens during his trial for receiving stolen goods in Providence, R.I., Superior Court. Manocchio is the former boss of the New England-based Patriarca crime family. The Providence Journal mistakenly heard from a source that Manocchio's nickname was "Baby Shanks" and proceeded to refer to him as so for years. His real nickname, the Journal later reported, was "Baby Shacks" — an allusion to two characteristics. "Baby" was used because Manocchio had a baby face while he was young, and "Shacks" was used because he had a reputation for "shacking up" with lots of women. 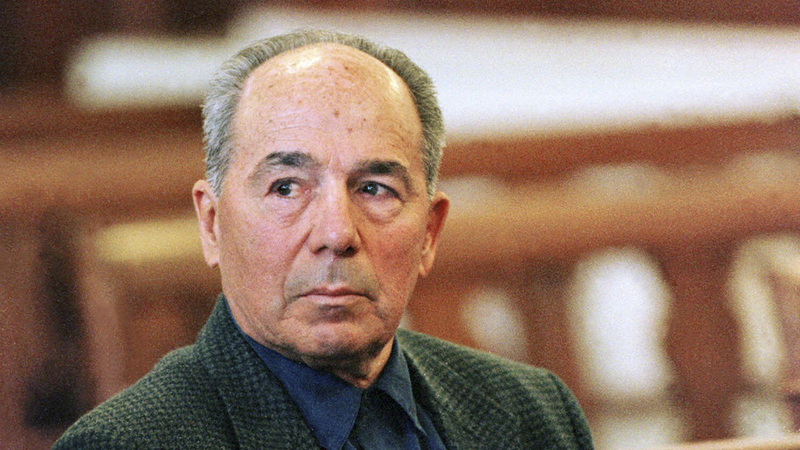 Manocchio pleaded guilty to extortion and after finishing his sentence in 2015, walked free at age 88. Carna was a captain in the Colombo crime family. He worked for the family for more than 30 years, with arrests dating back to 1959. His nickname came from his father, who owned a restaurant called "Lolly's" in Brooklyn. His father was known as "Senior Lollipop" and so Carna was nicknamed in accordance. Carna was jailed in 2012 for six months and fined $300,000 for money laundering as part of a mob gambling operation. Talia Wiener is an intern on NPR's National Desk.